Boston Handmade: Open Studios THIS SATURDAY! Once a year the studio I co-own with my friend Doreen opens it's doors to the public and gives all of our artists-in-residence an opportunity to show and sell their work. 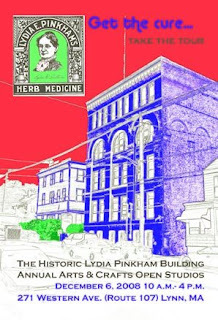 This is the third annual Lydia Pinkham Open Studios. Come see the artist of the North Shore Clay Studio (www.nsclaystudio.com) and all the other artist in the old factory building who will open their doors as well. There will be pottery, sculptures, paintings, collages, and illustrations. So come support your local north shore artists! December 6 from 10 a.m. - 4 p.m.